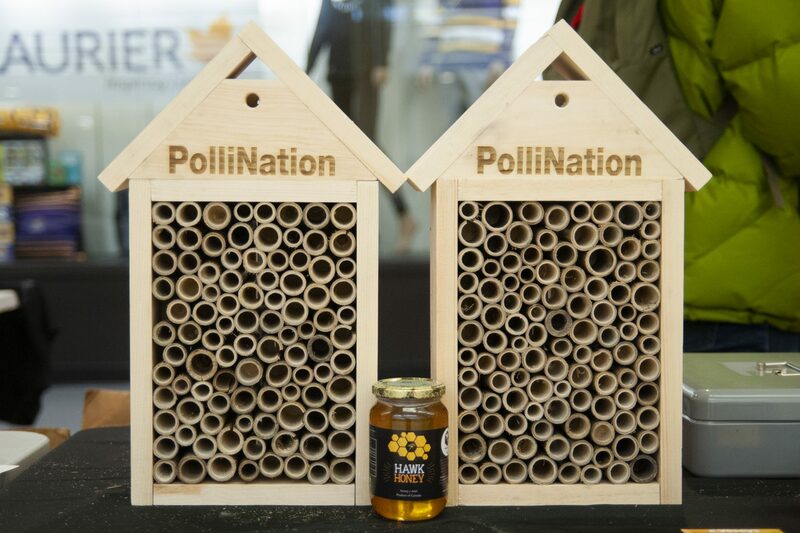 These PolliNation kits were made by the students of Enactus in the Science Maker Lab and the honey came from on-campus hives, at Laurier’s Northdale location in Waterloo. The purpose of these kits are to aid in preventing the local bees from extinction. According to enterprise manager of PolliNation at Enactus, David Townshend, the kits are geared towards mason bees. Mason bees are a solitary bee species — they are non-stinging, native to Ontario and pollinate a lot more than honey bees do. The issue Townshend brings up is that they do not live in colonies or build hives — leaving them far more at risk due to urbanization. “They rely on nature as their homes. Obviously with urbanization we’re tearing down a lot of trees, building cities and taking away homes for them — and they’re at risk of going extinct,” Townshend said. “The sustainability office saw our enterprise and how it is lined up with their work preserving the bee population. So they partnered with us, supplied us with a bunch of this honey and that is why we’re here today,” Townshend said. These PolliNation kits are birdhouse-like structures, with many small wooden tubes throughout. “That’s where we come in as a enterprise; we have these kits that give them a little replication of their ideal living space, because they like living in tube and circular areas,” Townshend said. The PolliNation kits also come with packets of native wildflower seeds and information pamphlets. To use these kits, Townshend lays out the simple instructions. “You plant the seeds in your garden … put the kit nearby and they attract mason bees and other pollinator species,” Townshend said. The price of Enactus’ pollination kits are thirty-five dollars and the jars of honey are ten, or sold together for forty dollars. The money earned from these sales will go to the upkeep of the apiary at Northdale. Hawk Honey is sourced from the campus apiary started by Tyler Plante, the outreach and program coordinator for Laurier’s Sustainability Office, and James Emary, manager of grounds services. The Sustainability Office reached out to Enactus to help market the honey and spread the word about their endeavours. To get further involved, Townshend and Madeleine Wilson, another Enactus member, direct students to look at their Facebook and Instagram pages, as well as their website.